When a new baby joins your family, people are going to want to visit. People are going to want to help. People are going to want to hold the baby. This is a fact of life. So how do you handle visitors when you just want time to bond with your baby? Bonding time is important for all new families, but sometimes it is difficult to get that process started. And if you are an adoptive family, bringing home a newborn, this may be a huge worry for you. But just because your baby did not grow in utero, it doesn’t mean you can’t form the same connection with your baby after adoption. Should adoptive families have bonding time with no visitors? Here are a few reasons why this is a good idea, and how to make it happen. 1. Make the most of ICPC. Take advantage of the processing time for your Interstate Compact on the Placement of Children (ICPC) paperwork. This wait can be very tough for adoptive families to endure. All you want to do is take your baby home and begin your new lives as a family! But this waiting period is the perfect time for you and your spouse to bond with your baby. This is quality alone time, because as soon as you arrive back in your hometown, everyone will want to meet your new family member. This simply means skin-to-skin snuggling with your newborn. This is even recommended with biological children, especially those born prematurely. Kangaroo Care allows the infant to get used to the sound of you and your spouse’s heartbeats, as well as your smell. This makes the most sense during your bonding time with no visitors. This helps your baby get to know who his or her parents are. 3. Embrace the middle-of-the-night feedings. When it is 3 a.m., you are exhausted, and your child needs to eat, it is sometimes hard to be excited about feeding time. However, meal time is an excellent time to bond with your baby. Your infant will associate the satisfaction of being full with the love of a parent. Hold them close to you and look in their eyes. Limit distractions, which can easily be done during this bonding time with no visitors. Set parameters with your family and friends. If you choose to embrace bonding time with no visitors, let people know. This may be difficult for some people to understand, but they should respect your wishes. This bonding time with no visitors may be for a few days or a few weeks. Again, if you are adopting out of state, you will have the processing time of the ICPC to enjoy some quality alone time with your baby. Once you feel ready to allow visitors, there still may be certain times during the day when you do not wish to be disturbed. So, should adoptive families have bonding time with no visitors? If you can make it happen, that’s great! Bonding with an adopted baby is not much different from how parents bond with their biological babies. 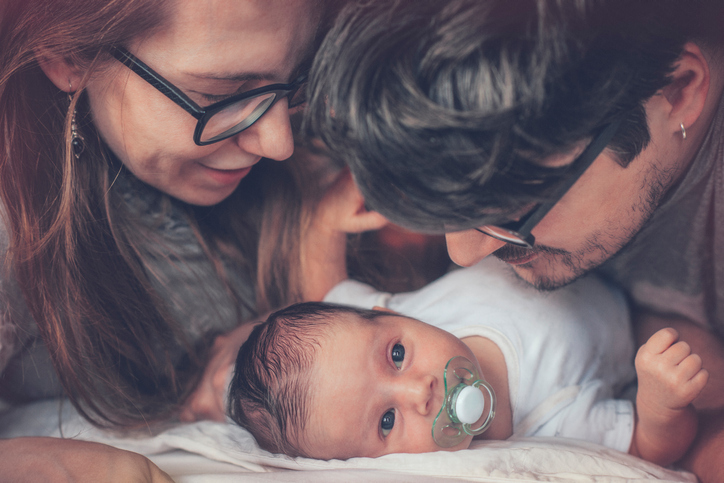 While you will have to wait until after your baby is born to start forming that connection, you will still use the same strategies biological parents use to bond. And you may find the whole process to be more natural and wonderful than you thought it could be.